At long last, I have organized all the photos from my Sleepy Hollow trip in October that I took during the afternoon, my first time exploring the cemetery. It would be no exaggeration to say I took hundreds more; at points, I was felt as if I needed to take photos faster than my shutter could manage. The photo album as it stands now is a mere 222 photos. For the record, I've left in some shots I normally would delete, if they were of some interest or no clearer picture existed for. In recounting my Sleepy Hollow trip, I last left off here-- at the gates of the Sleepy Hollow Cemetery, after exploring the village on a sleepy, chilly October afternoon. Set up at the cemetery gates were tables for the cemetery to sell their wares to support their historic effort. (Among which truly were the best souvenirs to be found in town.) 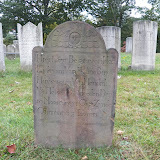 I bought the cemetery's main book, "The Old Dutch Church of Sleepy Hollow: Legends and Lore," and several other mementos, some of which bore the inscription "I lost my head in Sleepy Hollow." The Sleepy Hollow Cemetery exists in two parts. The immediate grounds around the Old Dutch Church which Ichabod raced for is known as the Old Dutch Burial Ground; for it is the original, old Dutch burying ground. Immdiately adjacent to the Old Dutch stones is the greater Sleepy Hollow Cemetery. There are no fences or signs distinguishing the two-- and as I walked, map in hand, I had no idea how big the historic cemetery actually is. The grounds were impossible to cover in a day-- the hills, the trees, the forest, the bridge-- and try as I wanted to I could not see, take in nor photograph all the tombstone beauty I saw. The timespan of the cemetery and the variety of nature, life and history that lives within the Sleepy Hollow Cemetery bears much similarity to my home cemetery of Forest Lawn's. The generations of people and their monuments that are left behind in such a rolling, secluded natural setting is at once like Forest Lawn, and distinctly different. In all my exploring of cemeteries, I had never, in person, seen the kinds of older, intricate stones that lie within the Dutch burial ground. And to see so many, up close and for my camera (as much as I wanted, I dared not touch them) was something special. If you made me pick a favorite, or most interesting monument inside the Sleepy Hollow Cemetery, I would easily pick Susie Hayt Dibble. I left Sleepy Hollow with a few photos of her monument, and some thoughts, which I believe I will post about separately this week when I have finished both this post and the next about the nighttime lantern tour that followed. That afternoon in the cemetery, there were two things working against me and my quest of taking as many photos as humanly possible while I saw all the sights there were to see. One, was the daylight as it dwindled. I had tickets for a nighttime lantern tour that evening, but I wanted to see everything I could before the tour; and then have it explained to me. The second was power. I had charged the batteries in my camera all the night before in my hotel room. Normally, if I spend even a couple hours to a whole afternoon roaming Forest Lawn and taking pictures, my batteries always last. They may be slightly depeleted after a few hours, but would be able to keeep going. In the Sleepy Hollow Cemetery, my fully charged batteries for the day lasted about twenty minutes before I had to run over to a gas station to get replacements that would work in my camera. Those lasted a little over an hour. The next batteries, from a different store, lasted a little less than that-- and my memory card, which I had thought would be able to take the afternoon, failed me, as well. Whether they were the victimn of the supposed draining that can occur around paranomally charged places, or the fault of poorly made or old batteries, I will never know. Toward the end, I had to furiously delete photos off my camera that I thought were less worth saving than any others. I did so until my batteries gave out. Once that happened, I took several pictures on my iPhone, before relenting to the chill which had now become cold and left to find more batteries, a new memory card and dinner in Tarrytown before the nighttime tour began at nine.